When industrial robotics were originally conceived, they were designed to use hydraulic actuators and vacuum tubes. While functional, the applications for these robots were limited. As technology progressed, the use of hydraulics eventually gave way to faster and more precise electric servo motors. Similarly, vacuum tubes were replaced by transistors and microcomputers. And the various devices used to record the robot’s physical position have evolved into resolvers and encoders. As various robot manufacturers ramped up production, improvements to speed, precision and reliability continued to ramp up as well. Lighter and more rigid castings were used. These, along with higher precision gear boxes and servo motors, have allowed robots to continue to shrink in size, handle larger payloads and have a smaller footprint on the manufacturing floor. Applications where hard automation used to be the only solution now have robotic solutions. 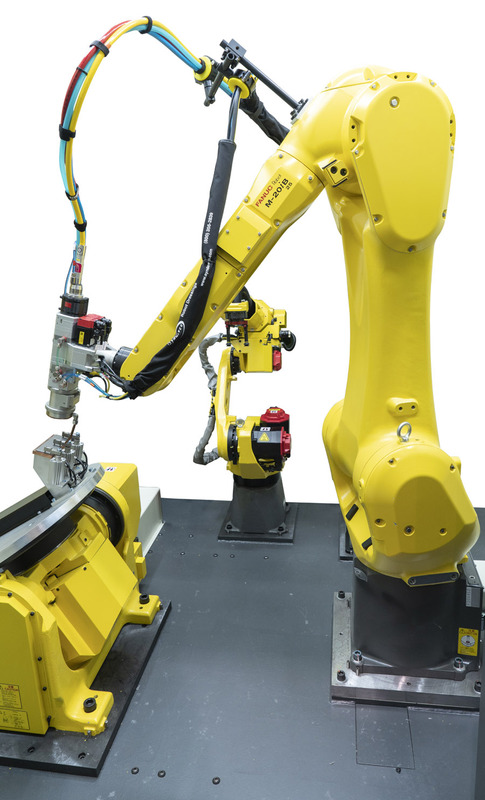 Fanuc robots performing laser guided dual arc welding. For instance, in the automotive industry, hard automation was used exclusively to move parts of the vehicle or the entire vehicle from one line to another or from one station to another. Now, robots can lift the entire vehicle and reposition it as needed. This solution is considerably more cost effective than hard automation and very easy to adapt to model changes or multiple models on the same production line. All of these robotic advancements help increase productivity, decrease cost of ownership and reduce capital expense while also improving the useful life of the machine. With these technological advancements, the industrial robot is quickly becoming commonplace in manufacturing. These advancements are not limited to the industrial environment. Manufacturers have developed humanoid robots that can run, jump and even help in a variety of surgical settings. Each of these diverse application areas are being absorbed as a whole across the automation discipline. 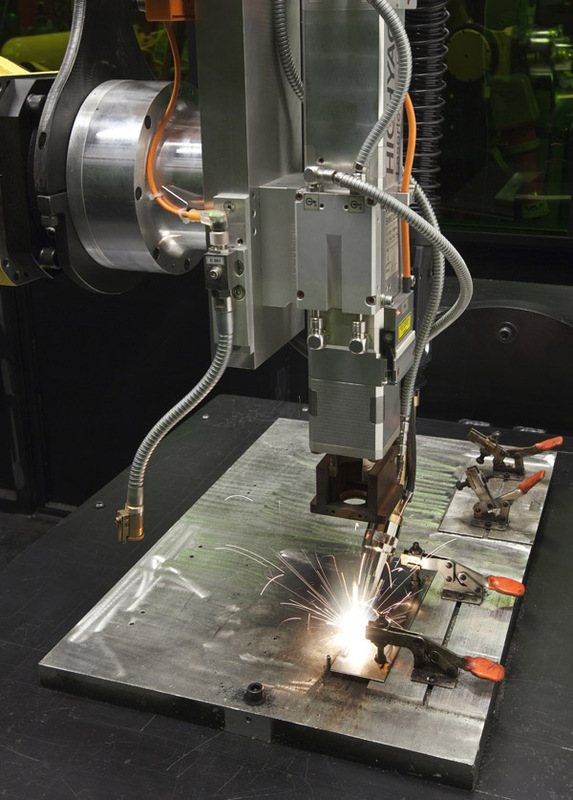 It’s these various advancements that have allowed manufacturers to mount a laser to a robot and perform welding or cutting with extreme precision and versatility. Lasers have also evolved in many ways from their early beginnings. The power range of lasers started from less than 1 W back in the 1960s to being pushed to 2 trillion W today. The newer fiber lasers have made a huge impact by reducing cost and size while also improving beam quality, reliability and efficiency. By using beam splitters, a single laser generator can be used for both cutting and welding. Beam splitters allow a single generator to use different fiber delivery sizes to optimize the process for different materials or material thicknesses. Previously, these processes may have required dedicated hardware for each. Also, advancements in optical heads and optical fibers have made it more possible than ever to apply a robotic arm. Along with the advancements in laser hardware are some equally impressive features in software. For instance, greater control over the power output and varying the available power across a larger range are now possible. The output can also be pulsed and the power, duration and frequency of the pulses can be varied. In welding applications, this allows better control of the penetration depth and profile and minimizes the surrounding heat-affected zone, making for a higher quality weld. All of these parameters cannot only be controlled by the robot, but can also be monitored by the robot for process and quality control. 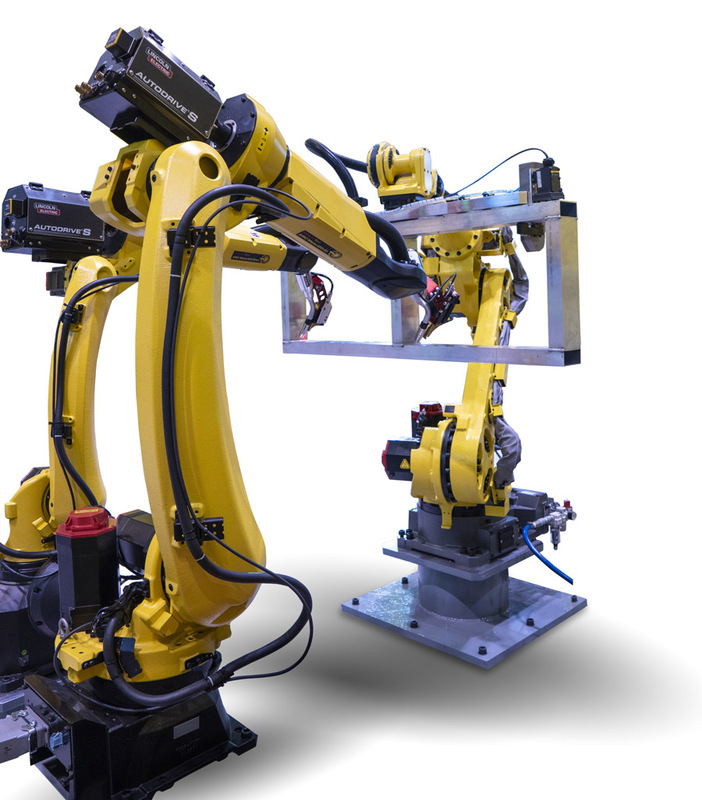 Fanuc’s M-20 robot series provides six degrees of freedom, allowing the user to break away from the flat plate limitations of an X-Y table. The robot also has the ability to directly couple the output power of the laser to the travel speed of the tool center point. This allows for a higher quality weld or cut when processing across curved surfaces or across multiple planes of surfaces with a continuous and consistent-looking end result. In an application such as laser cladding, the laser output can be used to dictate the rate at which the cladding material is deposited. Similarly, if performing laser brazing, the laser output can be tied to a wire feeder, and the speed of the wire being fed into the process can be regulated. Recent advancements within the laser processing head have now made it possible for the robot to control the trepanning motion in some heads. Similar to a scanner welding head that directs the laser beam using galvanometric rotating mirrors controlled by a microcomputer, the robot controls the mirrors or lenses using auxiliary servo motors and it is, therefore, programmable using standard teach pendant robot programming. This allows the robot to go to a fixed position and create unique patterns for different weld designs. These types of welding processes are quickly replacing traditional spot welding applications due to their speed, control and ability to be used on various materials beyond standard steel. As the capabilities of the robots and their controllers advanced so did the availability and implementation of peripheral devices. For instance, laser height sensors have been adapted into robotics as a means of locating parts instead of traditional touch sensing. The benefits being it is faster than locating a part with the weld wire and has a higher resolution and better repeatability than the weld wire. Furthermore, it does not require physical contact with the part allowing for searches in tighter areas and areas further away from the tooling. A laser weld head with a wire delivery device. Advancements in software allow laser power and tool center point speed to regulate the speed of the wire being fed into the laser process. There are also low-powered lasers that guide the robot along various seams or patterns in the material so that the robot can adjust its path in real time to ensure it is still performing quality welding and cutting even if the base material contains a significant amount of variation. Machine vision is another area that has grown tremendously in robotic automation. Industrial hardened camera systems have been used on robots to identify parts, read bar codes, perform inspections, pick objects from moving conveyor systems or out of bins, and locate objects in 3-D space and guide the robot to them. In a market that has been traditionally dominated by CNC controlled heads, robotically positioned laser welding and cutting is starting to gain market share as a result of the above mentioned advancements and, not surprisingly, by the flexibility of having a robot-carried processing head. This means six degrees of freedom are possible, which allows the user to break away from the flat plate limitations of an X-Y table and explore processing 3-D parts in 3-D space. This could be circular or square tubing or it could be part of an assembly like the inside of a truck frame. Additionally, if auxiliary motors or another robot are used to manipulate the part, access within complex geometries is made easier by positioning the part and the robot into an optimum location. This also promotes the ability of coordinating the motion between the part and the robot so that the process can continue uninterrupted. Another benefit of using a robot-carried head is the ability to change out the end-of-arm tooling between a welding head and a cutting head or change from a welding head to a pressure-driven grinding or polishing device for post-weld processing. This minimizes the real estate required on the expensive factory floor by not having individually dedicated processes. With a simple tool changer, one robotic cell can perform multiple functions, increasing the quality and optimizing the cycle time per part. This solution also minimizes the amount of expensive, dedicated floor space required for performing multiple processes.